Wine has many oddities. One of these is that it can create stereotypes. It may generate the impression that a particular variety can thrive only in a certain area or under a certain condition. For example, Assyrtiko can be majestic only when it comes from Santorini, Savatiano can only be used for Retsina, or that Mt. Pangaion in Kavala is perfect only for quality Sauvignon Blanc. My impression is that these are all merely myths surrounding the concept of terroir; even the perception itself of “terroir” might be a myth. Well, it seems we all have a soft spot for captivating narratives, from the myth of Petrus to the epic battles that take place in the Game of Thrones. Nevertheless, what is certainly true is the labor of the wine grower in the vineyard. And it is this attentive work in the vineyard together with careful handling in the cellar that contributes to the exploration of the limits of a variety and the wines it can produce. In other words, what is called “wine diversity”. A win-win case. On the one hand, we get to taste amazing expressions of varieties from places other than those that are their “perceived birthplace” and on the other hand we see less mainstream varieties producing splendid wines of high caliber. Thus, it is a pleasant surprise to taste a mineral Assyrtiko outside Santorini, a layered mature Savatiano or Roditis that have unfolded their virtues over time. But what is the case in the area of Kavala and Mount Pangaion? A region traditionally associated with cosmopolitan varieties such as Sauvignon Blanc and Cabernet Sauvignon, and which initiated a wine revolution in Greece during the 90s. Geographically the Pangaion zone, that dominates Kavala, stretches along a narrow valley; the valley of Pieria, which lies between Mt. Pangaion and a smaller mountain range named Symbolo. The lower soils are at 150-250 meters while the highest are close to 500 m. Theoretically speaking the zone includes the smaller valley of Akropotamos at 80 meters altitude, as well as the coastal area of Kariani. The majority of the vineyards are on gentle slopes of southern exposure and soils which are moderately fertile that produce yields of around 70 hl/ha. The climate is Mediterranean due to the proximity of the Aegean Sea with the vineyards generally lying low in altitude. Of course, the legendary Pangaion Mountain (that was once a Dionysian Worship Center and is presumed to be the place in which Dionysus was raised, according to one of the many existing versions) influences the mesoclimate of the zone with its strong winds. The result is a mild and rather pleasant climate, where the mean temperature during the growing season is 18.7°C and the Growing Degree Days (GDD), according to the Winkler Index, are approximately 1800. This is 200 GDD warmer than the fairly cool Amydeon, which together with Mantinia are among the coolest Greek wine zones. Despite the relative warmth, the nights are cool due to the cold air masses that descend from the mountains. This has a beneficial effect on the style of wines by giving them a firm backbone, high natural acidity, tannic structure and a noble finesse. 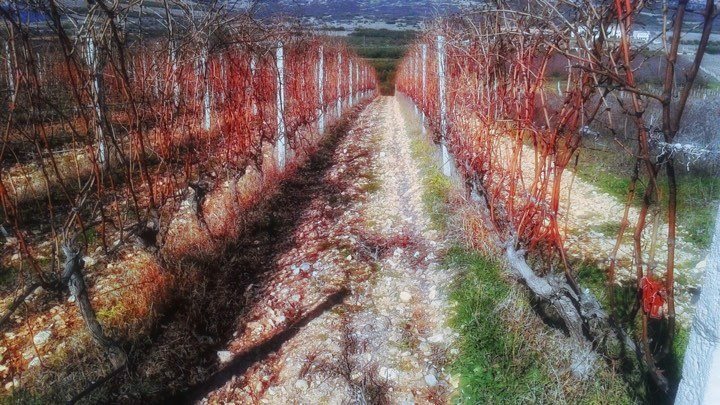 More specifically, at the Biblia Chora Estate vineyards, one of the leading wineries in Greece, the diurnal temperature difference can be as much as 15°C, says winemaker Vassilis Tsaktsarlis. In this zone the early ripening varieties, such as Sauvignon Blanc, Chardonnay and Semillon, have shown excellent results which perfectly match the above mentioned temperature range. Over time, however, Biblia Chora produced brilliant examples of Assyrtiko and Agiorgitiko that followed in the footsteps of the 2002 White Ovilos, a blend of an indigenous Greek and international varieties, that has become a true classic. So what is it that makes Pangaion such a blessed terroir that can produce wines of this scale and range? Wines that can compete, and even surpass, many of the Assyrtikos and Agiorgitikos from those of their own “homeland”. When it comes to terroir, the explanation I could offer is that first of all Biblia Chora has planted each variety in the correct location. For example, the Assyrtiko for Areti is on rocky soils that simulate Santorini conditions while the rest of the Assyrtiko vines are planted on heavier clay soils that contribute a more vegetal character to the wine. In addition, many vineyards are planted on extremely steep slopes and poor soils that lead to low yields per hectare; the Cabernet Sauvignon that is used to produce the red Ovilos is on such slopes. Poor soils are often associated with the production of top quality wines. The constant improvement that other wineries of the region are showing, such as Ampeloeis and Lalikos are a further indication towards the great dynamics of the Pangaion. In such distinctive terroir and with the careful and detailed vinification by Vassilis Tsaktsarlis and Vangelis Gerovassiliou, I would not be surprised if in the near future top examples of Xinomavro, Mavrodaphne or Cabernet Franc were produced. In the end, the dynamics of the vineyard together with the work of the producer make the difference and define a wine.